China Legal Publishing House, 2015-09-01. paperback. New. Ship out in 2 business day, And Fast shipping, Free Tracking number will be provided after the shipment.Paperback. Pub Date: 2015-09-01 Pages: 1425 Language: Chinese. 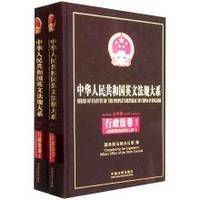 English Publisher: China Legal Publishing House Great People's Republic of China Department of English and regulations (Administrative Law Code Volume Set Volumes 1-2). brings together as of 2012 law by the General Assembly or the National people's Congress NPC Standing Committee enacted a total of 195. Accurate translation of legal documents need to pay a great deal of time and effort to ensure the accuracy of the translation. fr... Satisfaction guaranteed,or money back.